Are you using all the available tools when searching for medical jobs? Using All The Tools When Searching For Medical Jobs Online. For those in pursuing careers in the medical field, completing your education is the first of many large and cumbersome hurdles to clear. While the feeling of accomplishment one may feel after being awarded whichever degrees or certifications one pursued is well earned, the endeavor is far from over. Now, the primary directive is to actually find a job, which as many painfully acknowledge is perhaps the hardest part. On average, a job seeker will send their resume out to around 4 or 5 places per go-around. While this may seem fine, we have some upsetting news. With some degree of variation, a company receives close to 200 through 250 resumes for each job opening they list. On average, a company will begin to receive resumes with 200 seconds of posting an open position listing. Given the high level of competition in the current job market, it behooves one to get their resume sent in as timely as humanly possible. For those who lack the drive to aggressively hustle and bustle, medical job board websites like Monster seem tantilizing. At first glance, it seems too good to be true – a user posts their resume and a job recruiter seeks them out. the appeal begins to dwindle as the real stats on the matter are revealed. Our sources cite that an average of 427,000 job listings get posted every week on Monster alone. It doesn’t take a genius to realize that unless one has a spectacular, exemplary resume, that the likelihood of actually being recruited for a job lies somewhere within the boundaries of slim and none. So what is one to do in this seemingly dire situation? It’s simple: send more copies of your resume out to more places. Trust us, it isn’t nearly as daunting as it sounds. Specialized sites that cater specifically to doctors and other healthcare workers exist. Sites like PhysEmp and Medicus are great examples of these sites, however we provide these services as well. Using all three websites as your disposal to give you a wide range of options will increase the probability that you find the type of medical job you want. 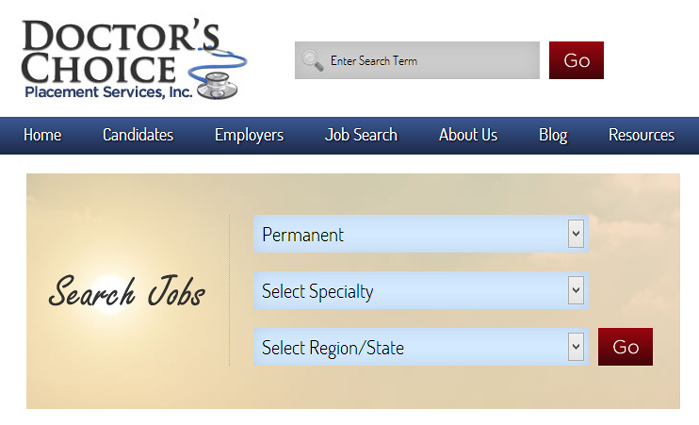 At Doctor’s Choice Placement Services, we provide a service that is unique to the other specialized job recruiter sites. 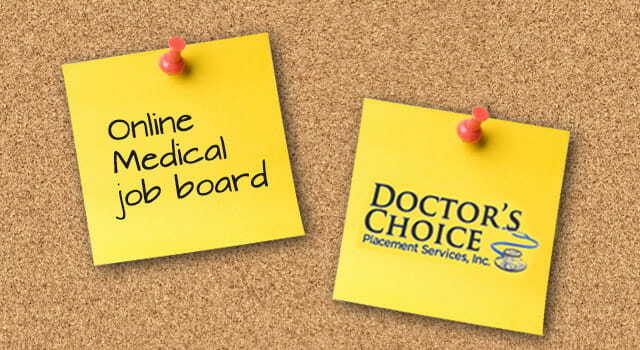 Aside from being recognized as a leader in national physician recruitment, Doctor’s Choice Placement represents thousands of physician job listings in rural, suburban, and urban locations across the nation. The first panel is entitled “Select Job Type.” Here the applicant will be presented with the choice to search for either a permanent or locum tenens medical job. In the second panel, the applicant is presented with the various choices of specialty that he or she are qualified for. Almost every type of specialty known to man is available to search. The last panel relates to region. Here the applicant can search for job listing as related to their geographical location. It should be noted that the options for either region, or state are available so as to provide the applicant with a wider or more specific range of medical jobs. Within the search options provided, we feel that we are best suited to provide physicians and other prospective healthcare workers with the tools needed to readily find employment.